Cricket: Will the rain relent for cricket? The big question ahead of this weekend’s NPCA Super League action is weather the rain gods will be kind enough to allow for some cricket to be played. It has been raining incessantly in Nairobi for the past two weeks. The heavens have opened up in the recent past, making life difficult not only for the citizens but also for the ground staff, who have had to battle hard to protect the outfield and the pitches from damage. 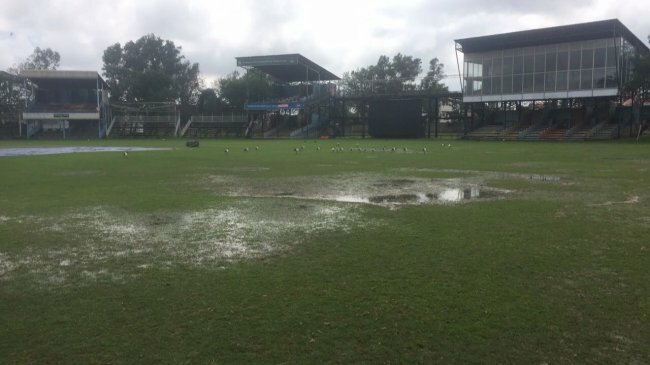 It has been a tough task for curators in almost all the cricket grounds in Nairobi as they try to ensure that the grounds are ready for the Sunday matches. On Thursday, a spot check by Sports News Arena found most of the pitches not in good condition ahead of their club’s league matches. At Nairobi Gymkhana, both the outfield and the pitch were waterlogged and the ground staff were still contemplating on what to do. The situation was no different at Sir Ali Muslim Club and Ruaraka Sports Clubs where the ground staff had little to do on the wet pitches. But at Peponi School where the top of the bill match between leaders Stray Lions and Swamibapa will take place, head groundsman Mathiya Komu and his team are not taking chances in ensuring that the venue is set for the crunch match. The pitch was dry and there was no water spot on the wicket. “The pitch is in good condition and we should have the match taking place. We have taken all the precaution to ensure that this match is not washed out,” Komu told Sports News Arena. Komu was on the receiving end from both his club (Stray Lions) and Kanbis when patches on the run up and a section of the wicket were wet when the two team were to clash three weeks ago. “Whatever happened last time was unfortunate and we won’t like the same thing to happen. We have brought in big and better covers and the match should go on if it doesn’t rain on the match day,” he added. "We have our fingers crossed. If it doesn't rain tonight and tomorrow, we will have a full game,"
The wash out has gone on to haunt Kanbis as they have now dropped to second, eight points behind Stray Lions. If the match finally happens, Komu expects that there will not be much change in the character of the wicket and it will stay true for the entire period and offer a lot of turn. A former national team opening bowler concurred with Komu on spin saying spinners from both sides will play a key role in top of the bill match. He observed the condition at Peponi School will favour spinners and so a side that will use its spinners well stands a good chance of carrying the day. "With the way the wicket at Peponi has been playing in the recent past, we should expect a turning wicket and a team that will execute its bowling well will have a big chance of winning,” he said. For the better part of this season, teams including the home team have struggled with the Peponi wicket. Teams batting first have struggled to get past 250. The situation has been tough for the team batting second as they have found it difficult in chasing the score. Stray Lions will bank heavily on their captain Hiren Varaiya in calling the shots with spin, while the visitors will bank on Jadavji ‘Malindi’ Bhimji. Varaiya is currently leading the bowling chart with 30 wickets from 13 matches while Bhimji is third with 24 wickets. Last week Varaiya bagged six wickets as Stray Lions mauled Ruaraka for 58 runs. "If you've got a bowler in a top form as Varaiya is in at the moment, it will be a big challenge for the batsmen," Suji said. Swamibapa will also hope that their top wicket-taker-left armer Jadavji ‘Malindi’ Bhimji will control the spin department. Just like Varaiya, Bhimji is in good condition but Varaiya appears to have an advantage because he will be playing on his home ground and knows the condition. "By being at the top of the bowling shows that he has been performing well,” Suji added. Apart from Shem Obado, Neil Narvekar and under-19 bowler Abhishek Chidambaran have been key spinners for the table toppers and could once again be called upon to tame the visitors. Third-placed Swamibapa also have a number of spinners who have been outstanding. They include former national team bowler James Ngoche and Rakesh Kahar. Second-placed Kanbis will be crossing their fingers that the pitch at Sir Ali is in good condition when they visit to battle it out with seventh placed Sir Ali. Kanbis have seen two of their matches washed out and in case this fixture is washed out too and the match at Peponi School goes on, then their chances of reclaiming the title will be slim. Nairobi Gymkhana will be seeking to maintain their fifth place when they host Cutchi Leva. Stray Lions v Swamibapa (Peponi School), Sikh Union v Obuya Academy (Nairobi Jafferys), Sir Ali v Kanbis (Sir Ali), Nairobi Gymkhana v Cutchi Leva (Nairobi Gymkhana), Kongonis v Ruaraka (Ruaraka).